Biodiversity – HOW THE CUBA 2018 PROJECT ORIGINATE? Published the second volume of Memoirs on Biodiversity! 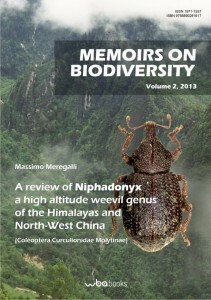 Finally, WBA has published the second volume of the series Memoirs on Biodiversity titled: “A review of Niphadonyx a high altitude weevil genus of the Himalayas and North-West China”. It is an important taxonomic work about the genus Niphadonyx (Curculionidae Molytinae) written by prof. Massimo Meregalli of the University of Torino. In this excellent taxonomic work the genus is re-defined, and differential diagnostic characters are discussed with respect to the most closely related genera. The work includes descriptions of 43 new species from the Himalayan Massif and North-West China. All collecting localities are georeferenced and detailed distribution maps are provided. Habitus photographs of all species and pictures of relevant morphological characters are also given. The publication of the book has been made possible by the support of the WBA Editorial and Scientific Committee and by the help of our members Giulia and Dante Vailati, who made a valuable work of page make-up and images treatment, fundamental for a high-quality taxonomic work. Particular thanks are due to the only private body which, since 2004, supported regularly our scientific and editorial activities: OPO Veneto (Organizzazione Produttori Ortofrutticoli del Veneto). Our goal for the future will be to maintain annual frequency of our first series “Memoirs on Biodiversity”.